This is a review of the 2018 edition. A new and updated edition of this classic bestseller. Printmaking is a wide subject with many specialisms. If you are unsure and wish to explore, this book is a good place to start because you can try out the different techniques. Discover and develop your skills is the key of this book. Information is highly visible with many illustrations throughout. Step by step demonstrations give you a real taste of the techniques. 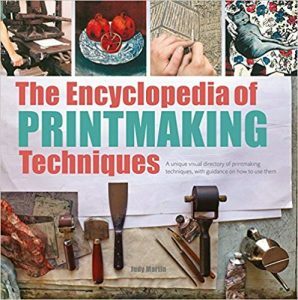 It covers tools and techniques, monoprints, linocut, woodcut, wood engraving, collage, screen printing, drypoint, mezzotint, etching, intaglio and lithography as well as some themes. It serves as an introduction so that you can get a feel for the techniques you wish to explore further. Linocut is one of the most popular techniques and has 8 pages in this section dedicated to planning, cutting, proofing and printing as well as printing in colour. Thorough and concise.